SpaceX engineers swapped out a suspect thrust vector control actuator in the second stage of their Falcon 9 rocket that halted Tuesday’ s launch of its Dragon commercial cargo craft. Dragon’s launch atop the Falcon 9 is now set for Saturday at 4:47 a.m. EST with live NASA Television coverage scheduled to begin at 3:30 a.m.
Thursday’s Expedition 42 science highlights included a pair of advanced remote control experiments inside the International Space Station. One experiment is studying the feasibility of controlling robots on the ground from space with a crew member using an advanced joystick that provides haptic feedback. The other uses bowling ball sized satellites, known as SPHERES, programmed by competing teams of high school students to accomplish tasks relevant to future space missions. 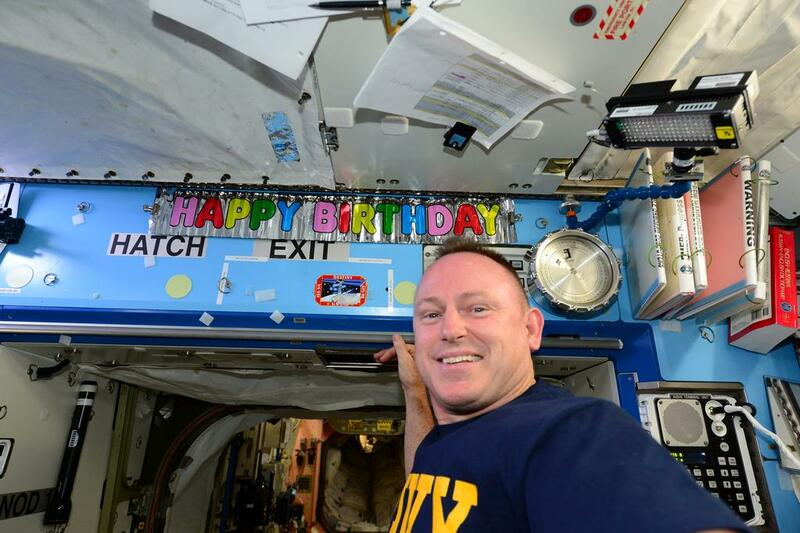 Another experiment is researching acoustic methods for locating punctures on the outside of the space station caused by human activity or micrometeoroid impacts. Crew members also studied the plasma environment in the station and photographed the ongoing man-made and natural changes to the Earth’s surface. 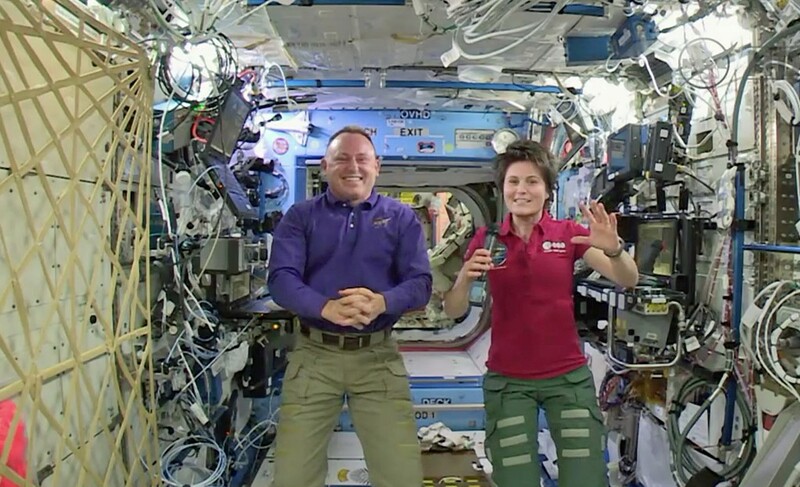 Expedition 42 Commander Barry Wilmore of NASA and Flight Engineer Samantha Cristoforetti of the European Space Agency (ESA) pose for the camera on Christmas day aboard the International Space Station. 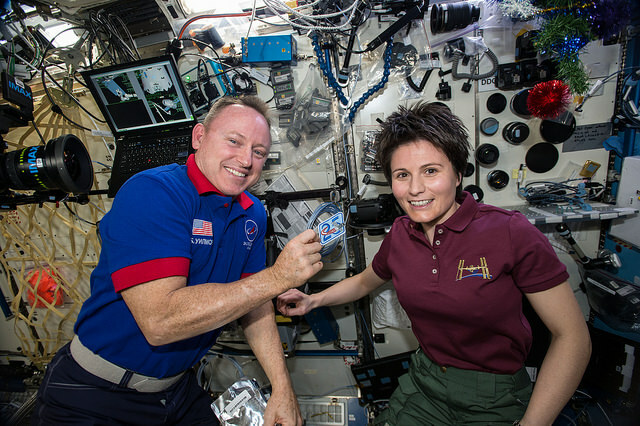 Wilmore is holding a patch traditionally given to astronauts following their first flight on a Soyuz spacecraft. 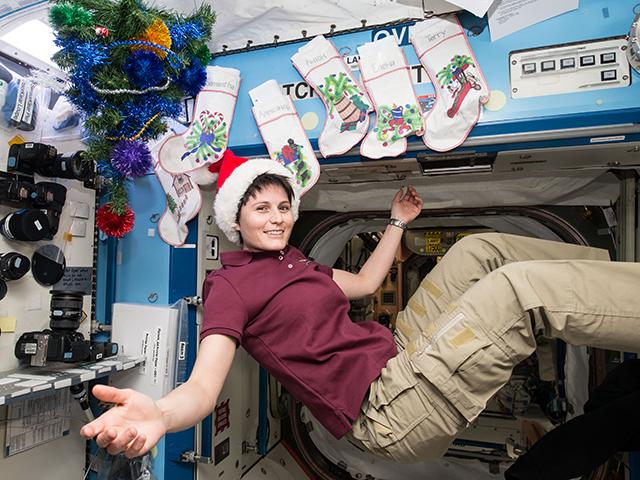 The six-member Expedition 42 crew had the day off and relaxed Wednesday for the Russian Christmas holiday. Meanwhile, SpaceX engineers in Florida worked to troubleshoot an issue in the second stage of the Falcon 9 rocket that halted Tuesday’ s launch of its Dragon commercial cargo craft. Dragon’s launch atop the Falcon 9 rocket is now set for Saturday at 4:47 a.m. EST with live NASA Television coverage scheduled to begin at 3:30 a.m. SpaceX’s fifth cargo mission for NASA’s Commercial Resupply Services contract will arrive at the International Space Station on Monday culminating in the robotic capture of Dragon around 6 a.m. Live NASA TV coverage will begin at 4:30 a.m.
(From left) Astronauts Terry Virts, Samantha Cristoforetti and Barry Wilmore conduct an interview with reporters from The Associated Press and KGO-TV, San Francisco. 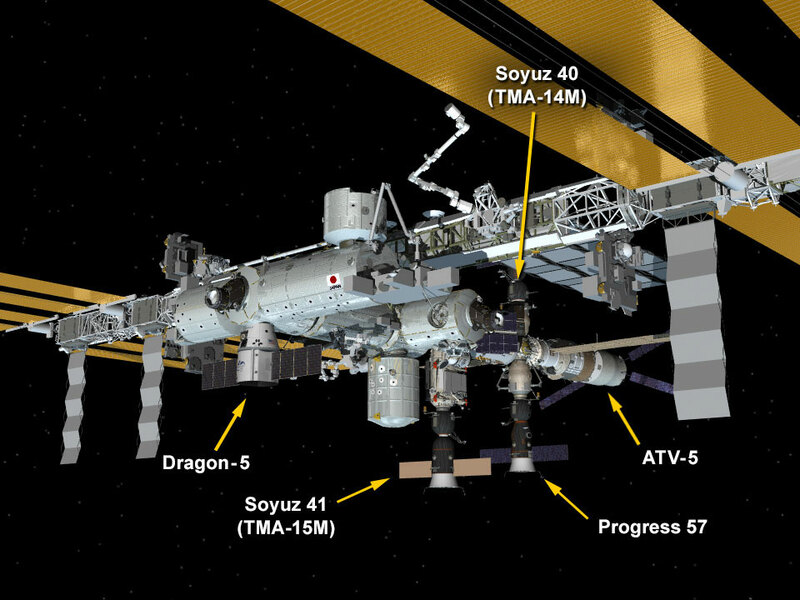 Expedition 42 will wait a few more days for a delivery from the SpaceX Dragon commercial cargo craft. Its launch aboard the Falcon 9 rocket was aborted Tuesday morning with one minute, 21 seconds left on the countdown clock. SpaceX is evaluating the issue and will determine the next opportunity to launch the company’s fifth commercial resupply services mission to the International Space Station. The next available opportunity to launch to the station would be Friday, Jan. 9. Meanwhile, the six member crew stuck to its task list of science benefiting life on Earth and in space as well as advanced maintenance of the orbital laboratory. Italian astronaut Samantha Cristoforetti participated in a study observing the aging of skin and tested an X-ray device that measures bone density in space. Flight Engineer Terry Virts opened the Fluids Integrated Rack to prepare samples for the Advanced Colloids Experiment-Microscopy-3 study. Commander Barry Wilmore conducted plumbing and ventilation fan cleaning tasks. Cosmonaut Elena Serova deployed dosimeters for a radiation detection study and downloaded data collected from an earthquake experiment. Alexander Samokutyaev took photographs and recorded video documenting life on the station before an afternoon of maintenance in the Russian segment. 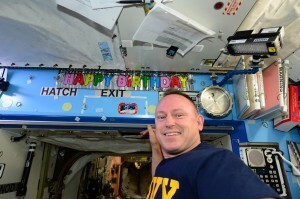 Anton Shkaplerov disinfected the area behind panels in the Zvezda service module. The SpaceX Falcon 9 launch scheduled for this morning at 6:20 a.m. EST aborted with one minute, 21 seconds left on the countdown clock. A thrust vector control actuator for the Falcon 9’s second stage failed to perform as expected, resulting in a launch abort. SpaceX is evaluating the issue and will determine the next opportunity to launch the company’s fifth commercial resupply services mission to the International Space Station. The next available opportunity to launch to the station would be Friday, Jan. 9. 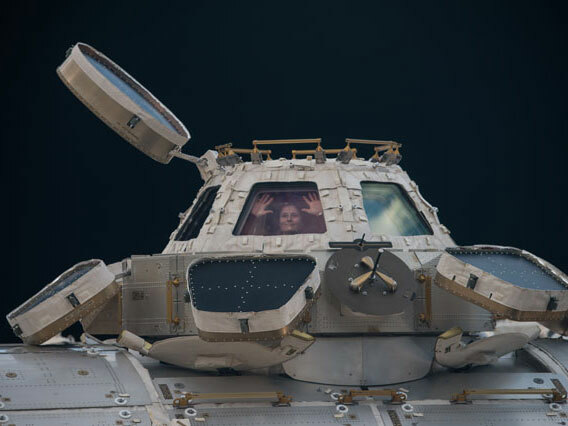 Astronaut Samantha Cristoforetti peers out one of the windows of the Cupola onto the Earth below. 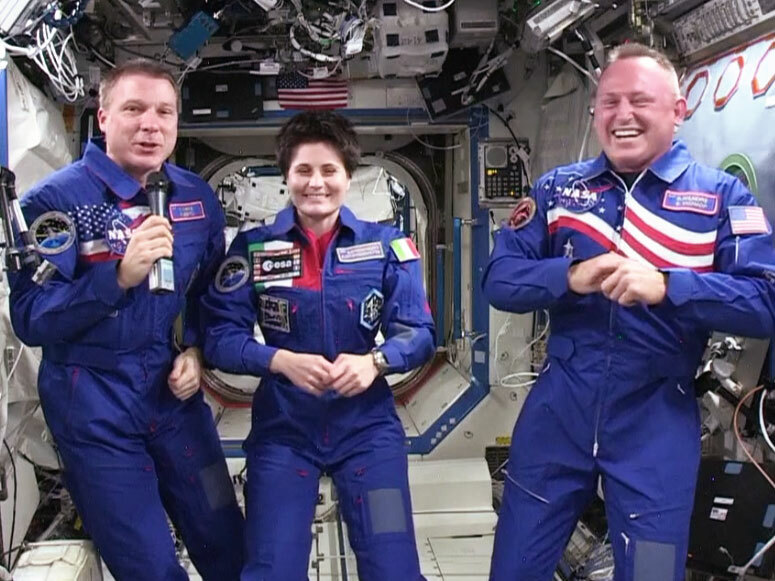 The first full work week of 2015 for Expedition 42 includes advanced science, high-flying plumbing and preparations for the arrival of the SpaceX Dragon. The Dragon commercial craft is due to launch Tuesday at 6:20 a.m. and be captured at the International Space Station about 48 hours later. Commander Barry Wilmore worked on the European Space Agency experiment Haptics-1 testing the remote control of robots on the ground from orbit using a joystick. 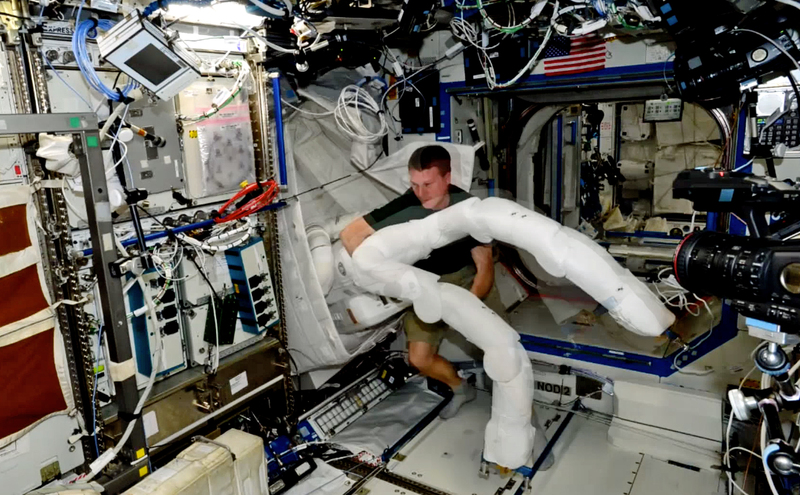 He later joined Flight Engineer Terry Virts gathering tools for a trio of spacewalks tentatively planned for February that will ready the station for future commercial crew and cargo vehicles. 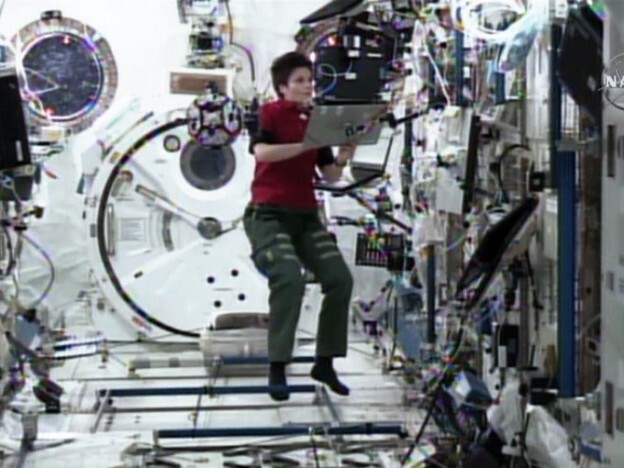 Virts started Monday with a periodic fitness evaluation as he and Italian astronaut Samantha Cristoforetti took turns on an exercise cycle. Virts then moved on to plumbing work replacing a dose pump in the Waste and Hygiene Compartment. Cristoforetti then participated in an educational experiment that explores the possibility of using plants to produce food and oxygen on the station. In the Russian segment of the orbital lab, cosmonauts Anton Shkaplerov, Alexander Samokutyaev and Elena Serova studied ways to detect micrometeoroid impacts at the station, worked on maintenance and photographed windows for a contamination inspection.